"It worked, your cooking skills have me soft as a marshmellow." "I traded a lifetime of servitude for a box of candy hearts." "It seemed like the best move, going with the assumption he wanted to keep that arm." "If Seth didn't cut it out, I was going to throw a pinecone at him." Isabella "Bella" Marie Cullen was born on September 13, 1987, and is the daughter of Charlie Swan and Renee Dwyer, who later got divorced when Bella was six months old. Bella moves back to her birth town of Forks, Washington when her mother married Phil Dwyer, a minor league baseball player who has to travel alot, so they can be together. She meets a mysterious family consisting of five adopted children. Edward Cullen in particular captures her attention. Bella finds out from a friend, Jacob Black, that the Cullens are supposedly vampires. Edward and Bella eventually get married and have a child which they name Renesmee. 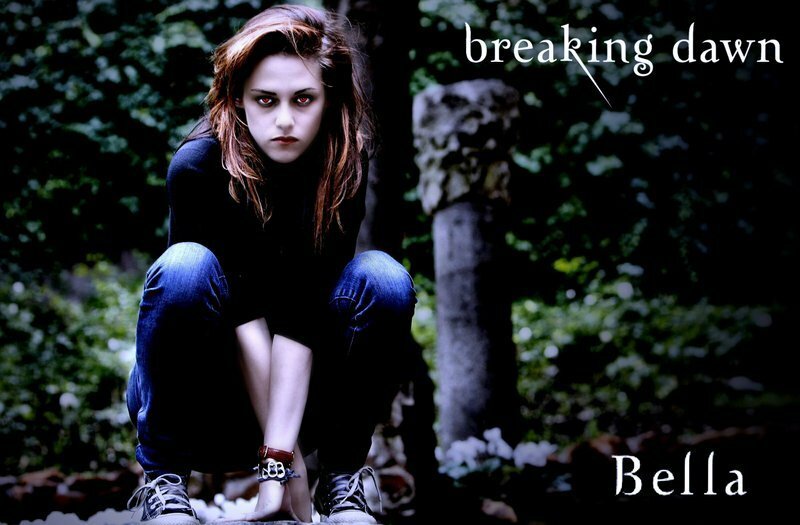 Eddward changes Bella into a vampire prior of her giving birth to save her life. Kristen Jaymes Stewart was born on April 9, 1990. She is best known as playing Bella Swan in the Twilight Saga. Kristen Stewart was born and raised in Los Angeles. Stewart's acting career began at the age of 8, after a agent saw her perform in her elementary school's Christmas play. Stewart was on the set of Adventureland when director Catherine Hardwicke visited her for an informal screen test which "capticated" the director. The film production for Twilight began in February 2008, and finished in May 2008. After the release of Twilight, Stewart was awarded the MTV Movie Award for Best Female Performance.